Over at the Man Recorder three Não Wave remixes that never got used have been posted. A Man Recordings Blog exclusive, here we have available for the first time three remixes left overfrom the Não Wave Revisited Project. 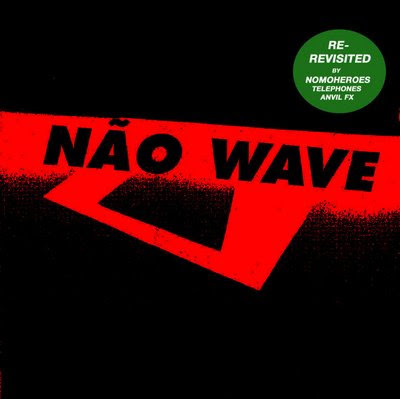 “Não Wave –Brazilian Post-Punk 1982-1988”, which was the first releasefrom Man Recordings in 2005 and is a fascinating document of a fertile period in Brazilian music and received great reviews from Pitchfork to the Village Voice. A Technopop band that were the predecessors of theBrazilian new wave. Formed in 1980, they released anindependent single ("Agentes" / "Angra") in 1982, andanother for a major label ("Professor Digital" /"Cidade Industrial") in 1983, splitting up in the sameyear. The few live shows they did always had a hugeimpact. The leader, vocalist and keyboard playerKodiak Bachine continued with an obscure solo work,while the guitarists Orion Mike (Miguel Barella) andDuo (Eduardo Amarante) went on to work in importantbands in the following years such as Voluntários daPatria and Azul 29. Black Future "Eu Sou O Rio"
The darkest ("dark" being the name given to Brazilianpre-goths) and most experimental band from Rio deJaneiro, where the radical musical scene was basedround the club "Crepúsculo de Cubatão" owned by theexiled English bank robber, Ronnie Biggs. Black Futurewere led by vocalist Márcio Satanésio and keyboardplayer, violinist and artist Tantão, two eccentriccomposers from the bohemian neighbourhood of Lapa,influenced by pop culture in general and comics inparticular. The group appeared in 1983 and the albumwas released in 1988, promptly disappearing. One ofthe most well-known tracks is "Eu Sou O Rio" (I amRio), which ironically celebrates the city, mixingpunk funk and samba. Man Recordings, from the favelas to the fjords,creating a new global community!